As we enter into our 21-day fasting and prayer time, I always anticipate what God is about to say and reveal to us as a church family. He promises to speak to us individually and corporately. It’s an exciting time of the year! Over the next few days, I’m looking back at some of my teachings on the discipline of fasting. I feel strongly it’s important to equip you with ideas and strategies to make your fasting time successful. Fasting can be incredibly frustrating. Satan knows that God’s power will be released in you if you persist, so he will throw everything at you…and very often, you can fell like it’s simply not worth it. I don’t want you to lose out on this powerful blessing. So keep some of these notes and use them as encouragement over the next few weeks. 3 But when you give to someone in need, don’t let your left hand know what your right hand is doing. 4 Give your gifts in private, and your Father, who sees everything, will reward you. 5 “When you pray, don’t be like the hypocrites who love to pray publicly on street corners and in the synagogues where everyone can see them. I tell you the truth, that is all the reward they will ever get. 6 But when you pray, go away by yourself, shut the door behind you, and pray to your Father in private. Then your Father, who sees everything, will reward you. 7 “When you pray, don’t babble on and on as people of other religions do. They think their prayers are answered merely by repeating their words again and again. 8 Don’t be like them, for your Father knows exactly what you need even before you ask him! 9 Pray like this: Our Father in heaven, may your name be kept holy. 12 and forgive us our sins, as we have forgiven those who sin against us. 13 And don’t let us yield to temptation, but rescue us from the evil one. 14 “If you forgive those who sin against you, your heavenly Father will forgive you. 16 “And when you fast, don’t make it obvious, as the hypocrites do, for they try to look miserable and disheveled so people will admire them for their fasting. I tell you the truth, that is the only reward they will ever get. 18 Then no one will notice that you are fasting, except your Father, who knows what you do in private. And your Father, who sees everything, will reward you. Notice the three core actions of a successful follower of Christ: One who gives, prays and fasts. Jesus never said, “If you pray…if you give…if you fast.” But these are the directives that will lead to righteousness. Fasting is simply the removal of one action and the replacement of another in its place. Typically, we fast food. 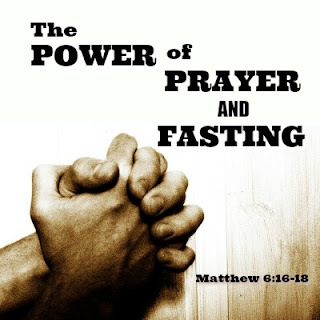 Fasting food is the type of fast most taught in scriptures. However, in our culture, with so many voices and activities overwhelming our lives, fasting can be successful in other forms as well. Fasting media is a big one for me personally. I’m a news junkie. I love to read the paper every day, usually at least two. I read magazines, blogs, periodicals…nearly anything I can get my hands on. I like to know what’s going on in the world. I find that setting aside the talk radio station, the television, the news casts and the newspapers really detoxifies me. It’s important to me to silence every other voice in my life, except God’s…including my own. I like to replace that “brain space” with worship music, teachings from my favorite pastors and I always read (or re-read) a Christian classic by one of my favorite authors. Fasting is a challenge. Find out what the Lord would have you do. Fast one meal each day? Fast an entire 24-hour period each week? A 3-day fast each week? Maybe fasting certain foods like sweets, sodas, sugars, fried foods, etc. But please remember this: If it doesn’t mean anything to you, it doesn’t mean anything to God. One more important thing to remember about fasting: Fasting is not penance for sin. Don’t approach your fasting as a punishment…you’ll quickly get sick of trying to appease God for your sin. Jesus Christ already paid the price for our sin, so that game is over. Get excited about fasting and prayer and allow your faith to rise. Anticipate all that God wants to reveal to you. He is speaking. Fasting doesn’t cause God to speak. Fasting causes you to hear a God who has been speaking all along. Fasting will detoxify your soul from fleshly desires. The normal burdens of life can cause unbelief to rise and your faith to be smothered. 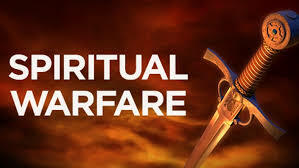 Fasting and prayer will wash all those contaminants and allow your spirit to soar in faith and fellowship with the Lord. Get ready to hear! Get ready to see! God is going to blow your mind! We are in the process of moving our content to our new blog site. The new site will be up and functioning in the next few days.